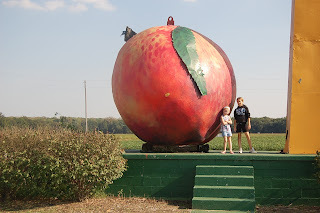 Just north of Vincennes, on Highway 41, there has been a giant peach along the side of the road for as long as I can remember. We always comment on it when we are heading to Flordia but we've never stopped. 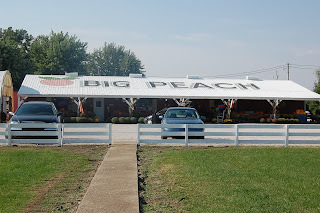 The peach belongs to a great roadside market, aptly named The Big Peach. Since we weren't in a hurry this trip, we stopped in to check it out. 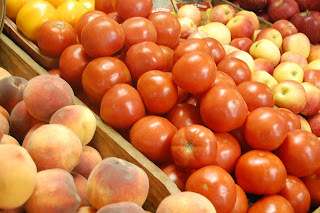 There were lots of beautiful fresh produce: peaches, tomatoes, apples, onions. Tons of Amish-made preserves and noodles. Ciders. Crafts. All sorts of things. I can't wait to come back and check this out next year earlier in the season. I can just imagine all the beautiful berries they probably have. And melons. 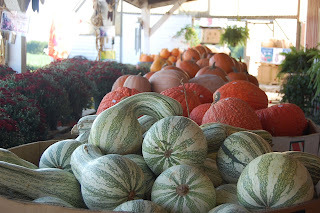 Lots of watermelons and cantalopes come from this area of Indiana. They also had about a million varieties of Indiana-grown popcorn. I'd been telling the girls about how we used to grow our own popcorn when I was little so this was a great opportunity to pick some up. We selected a great blue variety. It will be fun to show the kids that popcorn doesn't have to come from a microwave! The kids enjoyed looking at all the varieties of pumpkins and gourds The Big Peach had. There were blue pumpkins and bumpy pumpkins. Tiny and large pumpkins. Pumpkins of all shapes, sizes and colors. The neatest thing we saw didn't really have anything to do with food. 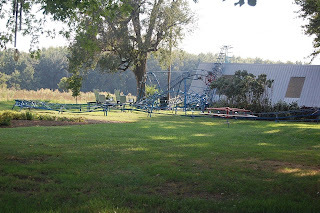 Between The Giant Peach and Vincennes, Indiana lives a man who apparently loves roller coasters. Enough so that he built his own in his back yard! It's the coolest thing ever. It has a 360 degree loop, goes over the garage and of course has a cult following on the internet. LOL! For better pictures check out these links. There's even a video of someone riding it!